The Philadelphia Region is rich in ethnic diversity. 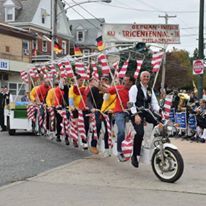 The Steuben Day Observation Association of Philadelphia and Vicinity is a non-profit organization dedicated to preserving German-American Ethnic Heritage and Pride. The organization was founded in 1968. Each year the Association sponsors the annual German-American Steuben Parade to commemorate and honor the accomplishments and contributions of General Friedrich Wilhelm von Steuben and the countless German-Americans that have followed him. General Friedrich Wilhelm von Steuben was responsible for the training of the Continental Army at Valley Forge. This greatly aided the American Colonies to win the Revolutionary War. Baron von Steuben's Revolutionary War Drill Manual is still the basis of today's United States Military's training. The Association is comprised of a dedicated group of volunteers from the various German - American clubs in the Philadelphia area and individuals. If you are interested in offering your services, please contact one of the Association officers. Among the various German-American events held in the Philadelphia area, the Association sponsors German Day. German Day is one of our annual fund raising events held during the month of June at one of the area's German clubs on a rotating basis. This is where the Association's Cornflower Queen of Philadelphia and her Court is presented. The Cornflower Queen represents the Association at various events and functions throughout the area and in Germany. The cornflower is the national emblem of the German-American community in the United States. It's only appropriate that Philadelphians be proud of their German - American history. The Germantown section of the City of Philadelphia was founded in 1683 by a group of immigrants from the German city of Krefeld. They were invited by William Penn to participate in his "Grand Experiment". German-Americans continue to be an important influence to this region. © Steuben Day Observance Association of Philadelphia and Vicinity * All rights reserved.